I mean, I think she's serviceable. She's not the worst voice actor in any of the dubs. I'd describe her performances more as "immediately forgettable" than I would "painfully awful." It's clear that voice acting wasn't for her which is why she hasn't done any other voice work, but I still think with competent direction and time to really study the scripts in advance, she would have delivered a less wooden performance. At least her voice doesn't make my ears bleed and she doesn't sound unrecognizably generic. Don't get me wrong; she's definitely the weakest member of the main CWI dub cast; I just think some fans can get a bit carried away ragging on her performance. I prefer it over Sandy Fox.. I personally preferred Tracy Hoyt the best out of all of them the scratchy nasally kid voice she did seemed appropriate to the characters nature she was stubborn and bratty so it made sense to me Stephanie Beard and Sandy Fox sound too precious and composed it comes off as very artificial. I just rewatched Linda as Neo Queen Serenity during the "free fall" scene from the SuperS finale... And even though she used her natural voice and wasn't supposed to imitate Terri, her performance sounded totally stiff and not touching at all. Sounded like she was reading the script. This makes me believe that even if she was allowed to give her own take on Serena, the performance would still end up bad. I disagree. I really liked the peaceful tone she used. It was quite different from Kotono screaming and begging, but still very effective. You can still hear desperation in Linda's voice, especially when she says "Rini, wake up fast! Please!". She was falling to her death. You can't possibly be "peaceful" in such a moment. I respect that you like it, but I find evertthing in that dubbed scene a major fail. I felt like it fit the dream-like aspect of the series. It's a very surreal scene, and her acting fits. 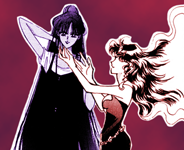 You can accept two girls falling passed a 20 floor building for 3 minutes, but not Serenity calmly speaking to Chibimoon? I think she would have made a good Sailor Pluto. It's not that Tracy's take doesn't fit. It's that it takes an already unlikable trait of hers and further amplifies it. I much preferred Sandy Fox's spin on her in R, because she helps remind you that even when Chibiusa is being a brat, she's still a little girl acting up due to being in over her head. Ultimately I feel Stephanie's casting as Mina reeks of a lack of foresight. I get wanting a big sister character to round out the group, but it's unnecessary to turn a character into that when the show gives us that later on. It can pass during Classic, but as soon as R rolls around it starts becoming apparent what a miscast she was. Say what one will about Cherami as Venus, but compare her take on the Nurse Minako episode to Stephanie's and it's hard to say Stephanie's the better fit. I liked some of the Cloverway voices but I could not stand Liza Balkan's take on Ami, she was extremely miscast, made Ami/Amy sound like a total wimp, and sounded like she didn't take the Sailor Moon dubbing project seriously. I honestly can't even remember any of their voices, I probably haven't wanted it since it aired. I wouldn't say I particularly like either, other than some nostalgia and appreciation for introducing me to Sailor Moon... However, I actually think I have a slight preference for the Cloverway dub. I agree that the DiC dub is more polished -- however, I preferred the Cloverway dub for having a slightly more faithful script and keeping the original musical score. DiC didn't even feel like the original show, whereas Cloverway more or less kept the "feel" of the original show intact and I feel a huge part of that has to do with the music. 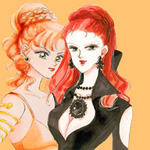 That said, I still dislike Cloverway for their changes to Haruka and Michiru's relationship. But I have fond memories of being a kid and how excited I was when S premiered on Toonami for the first time. Before that, I'd only heard of the S season (not sure why I never bought the fansubs) and couldn't believe there were new episodes on TV, not to mention how exciting the storyline was. I'm actually a huge fan of the Cloverway dubs. I have a lot of nostalgia for it, moreso than the DIC dub because I was actually able to follow the anime. It played every day right after I came home from school so I taped almost every episode. I can still watch some episodes now. Yes, it had cringey slang and sometimes a bad script, but the voice actors are sooooo much better than the Viz cast, mostly. The Viz dub is painfully boring, and the script is so stilted and stuff. Linda wasn't perfect (I personally enjoyed her performance) but I loved listening to her and Beard go at it in character. Loved that duo. in preference Japanese ORG is my go-to but why must it be end-all be-all?